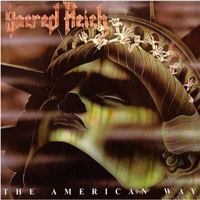 Doing a re-release of Sacred Reich's thrash metal classic "The American Way" from 1990 is one of the best ideas Displeased Records have ever come up with. After the release of their debut "Ignorance" and the two EP's "Surf Nicaragua" and "Alive at the Dynamo" Sacred Reich came up with this masterpiece. I remember when I bought it back in 1990 I was blown away, and I still consider it to be one of the top 5 albums in this genre. Back then they were among my favourites together with Forbidden, Death Angel, Vicious Rumors and Savatage. You will have to search a long time to find another record from that period that is played so tight. Just turn up the volume and bang away to "Crimes against Humanity", "The American Way" or my all time favourite "Who's to Blame". Sacred Reich are touring the European summer festival this summer, let's just hope that there will be a new album as well. "The American Way" comes with six bonus tracks and a video clip. Essential for all metal freaks.